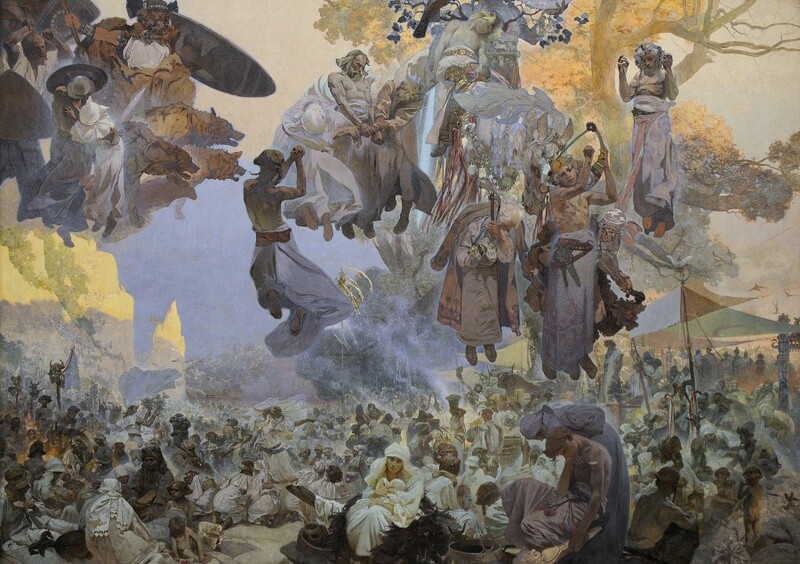 In this post I am going to talk about one of the most representative painter and designer for the Slavic people, Alphonse Mucha. The essay is organized as it follows: in section 2 I am going to talk about Alphonse Mucha’s life and history; in sections 3 and 4 I will be approaching the subject of his style and what made him a representative figure for the Art Nouveau movement and about how his work has influenced the history of the Slavic people and section 5 contains a conclusion and some final remarks. Alphonse Maria Mucha (born July 24, 1860- died July 14, 1939) was a Czech artist and “one of the leading figures in Art Nouveau” (Hutchinson Dictionary of the Arts, no date). Mucha studied art in Prague, Munich and Paris where he also worked as a graphic designer, creating posters for the actress Sarah Berndhardt, his first, and most famous being Gismonda (image 1), he also started designing textiles, furniture, ceramic plaques and jewellery. His most famous work though, remains The Epic Slav (image 2), a set of 20 paintings illustrating the history of the Slav people, set that took almost twenty years to finish. He donated his Slav Epic paintings to the city of Prague before he died, in 1939. Mucha was a very gifted artist that “tried so hard to bring art into the lives of people- his greatest passion- by designing first class posters, advertisements, labels for soap, toothpaste and butter, mosaic panels for municipal swimming pools, crockery, textiles, jewellery (…) and every conceivable kind of illustrative work” (Paul Johnson, 2003), this is one of the most obvious arguments to include him in the Art Nouveau movement which, by definition sais that “an artist should work on everything from architecture to furniture design so that art would become a part of everyday life. By making beauty and harmony a part of everyday life, artists make people’s lives better” (Art Nouveaum, no date) . 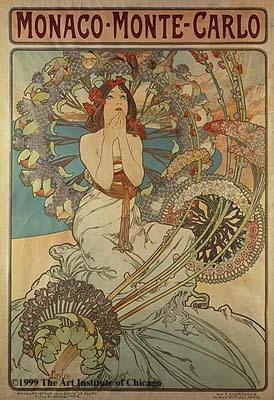 this is what Mucha wanted to do with the help of his wonderful designs and with the help of the colours he uses, that give the viewer a warm feeling of summer, Mucha manages to give his artwork an unique, harmonic feeling “his fascination with the sensual aspects of female beauty- luxuriantly flowing strands of hair, heavy- lidded eyes, and full-lipped mouths- as well as his presentation of the female image as ornamental reveal the influence of the English Pre-Raphelite aesthetic on Mucha” (Encyclopaedia Britannica, 2010) and, his work can be also compared with Lautrec’s, both having a passion for representing women in their illustrations. But, unlike Lautrec who simplifies the human body form, reducing it to simple shapes, Mucha’s artwork presents “idealized images of young women with long flowing hair, with a patterned flower border” (Hutchinson Dictionary of the Arts, 2008). 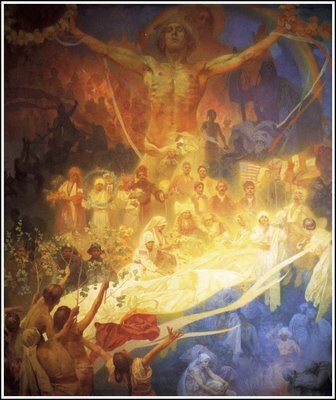 What separates Mucha from the rest of the Art Nouveau artists, in my opinion, is his passion for the Slavic culture and the hard work he put into creating the most representative paintings for the Slavic culture, The Epic Slavic which “has twenty paintings, ten on Czech subject, ten on broader Slavic Themes” (Derek Sayer, 1998). Although, the masterpiece had some bad reactions coming from the political side “the public of Mucha’s homeland received the Epic with mixed emotions, one can even say with disfavour from the most part” (Jiri Mucha, 1967), we can’t remain speechless in front of such a beautiful and expressive manifestation of art and nationalism, and, in my opinion, Mucha managed, with his talent and vision to give another meaning to the word “nationalism”. The irony that surrounds these amazing paintings is that is such a nationalist country as the Czech Republic, there was a big lack of interest in exhibiting his paintings, a great gift for the city of Prague. All in all, I think Mucha’s work is very interesting and he will remain an important figure in the Art Nouveau movement and managed to express, with the help of his work, his feelings and visions and his unique style will always be a source of inspiration for artists.